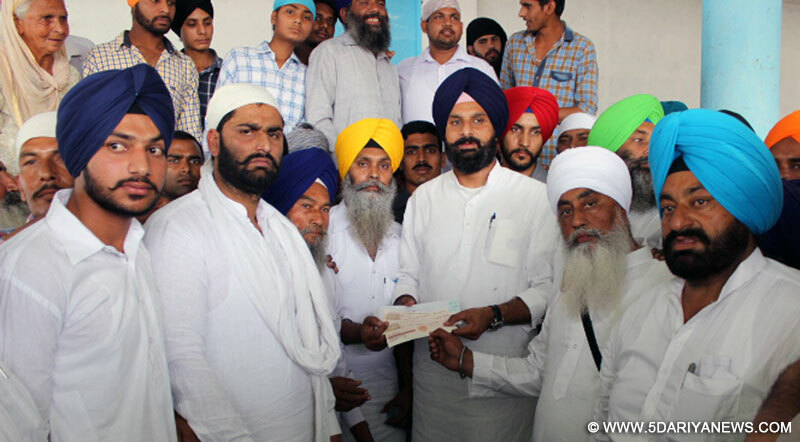 Punjab government has always given priority to pro-people decisions and the government has recently completely done away with the registration fee for the transfer of assets between blood relations because of which thousands of people have got relief to the tune of Rs 175 crore in the first three months of this exemption, said Revenue and Public Relations Minister Punjab, Bikram Singh Majithia while addressing the people after laying the foundation stone of development works at village Chananke, ArjunManga.Bhoyewal, new chananake, old channanake, Binzerwal , puranaTanel and Bhatike.Majithia also disbursed a grant of Rs. 3crore20 lakh for the development these villages. Addressing a mammoth gathering he said this important decision taken in public interest by Mr. Parkash Singh Badal and Mr. Sukhbir Singh Badal, will go a long way in ending property disputes among many families. He asked people to take maximum advantage of this facility. Speaking about the property transfer fee waivers between blood relations, he said that now an expenditure of only Rs 900 is incurred on transfer of property between blood relations such as husband-wife, son- daughter, father- mother, sister- brother, grandson and granddaughter. He said that the social security Fund, the social infrastructure Fund and stamp duty in addition to the registration fee has been ended with the aim to encourage people to register their assets by legal methods and avoid future controversies. He further said that earlier the government had slashed the stamp duty for the registry of power of Attorney given for the purpose of sale and transfer of the property to 0.5 per cent from 2 per cent.Revenue Minister said that the Punjab government started a help line (dial 168 or 1800-1800-168) for bringing transparency and efficiency and to provide information about land records just in a phone call. He said that this has already started yielding positive results. He said that complaint received on the toll free number is being dealt in a time-bound manner. He said that in addition to this, e-Stamping system has been launched to end exploitation of the people and the complete land record is now online and is also available on the department's website. He said that there are 164 FardKendras for 12960 villages out of 13001 villages in the state which the copy of the land record is provided to the owner in less than 15 minutes.On this occasion besides others, Major Shivi, Sukhwinder Singh Goldy, Gurjinder Singh Dhapaian, Prof Sarcand Singh, Balraj Singh Aulakh, SarpanchSatnam Singh Arjun Manga, Sarpanch Major Singh Sahota, Baba Sukhwant Singh, Kulwinder Singh, Ajmer Singh, Master Davinder Singh, Davinder Singh, a former sarpanch, Randhir Singh, were also present.